Lot 11600, Main Road, 84400 Sungai Mati Ledang, Muar, Johor, Malaysia. Nitcos Technologies Sdn Bhd is an established company incorporated in Malaysia under the Companies Act 1965. We are the tape manufacture for self-adhesive tapes and others packaging products. 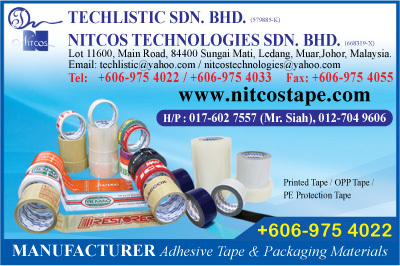 We provide one-stop adhesive tape solutions and services within Malaysia & also foreign companies. A hopeful Tape Manufacturer - Our hopeful is to become Asia-Pacific's Leading of Tape Manufacturer comprehensive range of self-adhesive tapes widely used in all industry, Food Industry, Packing Industry, Machineries Industry, Garment Industry and etc. Nitcos signify high quality products and prompt services. Nitcos is our philosophy. We are tape manufacturer that committed in providing our valued customers with high quality products at a competitive price and prompt delivery of customer orders. We also provide professional advice on the correct application of product for the right job in order to save their cost. Closely to our values customers; pay more attention, concern and listening to our values customers need also was ours objective. It does can be minimized conflict and let all the process in the effective and efficiency place. 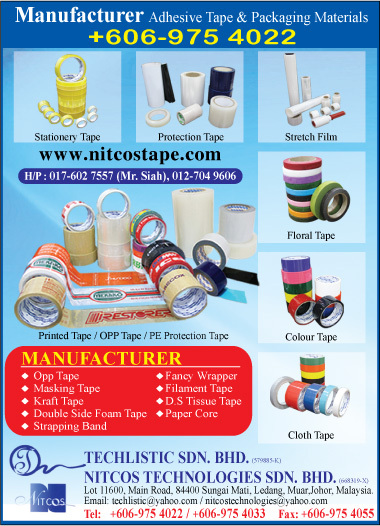 Our Quality Brands - Other than our house brand – Nitcos Tape, we also offer related brands such as 3M, Nichiban, Nissho, Wonder and etc. under its own brand in order to distribute to both local and foreign companies operating in this region on an exclusive basis. We also offer customize services to our valued customers, i.e. direct slitting and die cutting services to convert materials to meet customers' specification. Having to secure this market, we are determined to strengthen our product quality, customer service and R&D. We are reliability and enduring our commitment to the demands of the future. We will always strive to serve the very best to our valued customers. Your Satisfaction Is Our Objective -Your satisfaction with our product quality and service is our goal. As a reliable tape manufacturer, we look forward to establish friendly long-term cooperation with you in future.